Charlotte transforms the lives of disabled children in Zanzibar. After visiting Zanzibar and seeing the cruel, hard reality of the problem first hand Dr Charlotte Hawkins set up a clinic to help combat the increasing problem of club foot on the African island and the Infant Club Foot Appeal (ICA) was born. The charity established the island's first club foot clinic at Mnazi Mmoja Hospital in Stone Town with the aim of training clinic staff in the effective use of the Ponseti Method using donated materials and equipment. Liverpool based Algeos, is a leading supplier in orthotics and prosthetics, has been a supporter of the Infant Club Foot Appeal for over four years. In that time, with the help of leading industry partners, much needed O&P donations have helped to equip the clinic in Zanzibar to transform the lives of thousands of disabled children with clubfoot and other feet deformities. 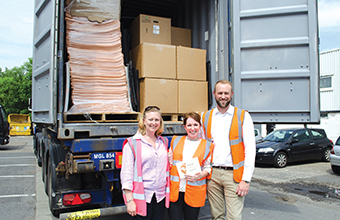 The latest shipment of O&P equipment and materials left Liverpool on 31st May, 2018 on a journey of just under 5,000 miles to Pemba Island, part of Tanzania's Zanzibar Archipelago, where a much-needed new clinic will be created. A number of Algeos partners worked together to source the products and equipment for the clinic including Blatchford, Truelife, Buchanans, De Novo, QMC, Superfeet and Birmingham Children's Hospital. Club foot is a foot deformity affecting one or both feet. In Zanzibar, as many as 50 babies a month are born with their feet turned inwards and upwards. Without treatment these children will only be able to crawl for the rest of their lives. The Ponseti Method uses a gentle, manual manipulation of the foot, followed by the application of toe-to-groin plaster casts. Dr Hawkins is a specialist in lower limb paediatrics in Harley Street, London, who was moved to set up the ICA charity after witnessing the scale of the problem in Zanzibar.